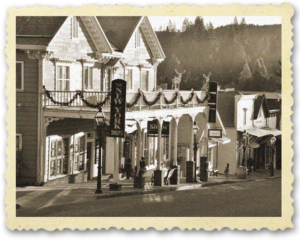 The New York Hotel on Broad Street in Nevada City, CA – home of the Truffle Shop for 30 years. Here we are in the year 2017, 30 years after the Truffle Shop first opened up in the New York Hotel on Broad Street in Nevada City, CA. In those days there wasn’t the Internet, you couldn’t visit the website. You had to call in or fax in an order form of what you wanted. Or, even better, come by the Truffle Shop while in town and get some truffles directly from the staff. We had a newsletter in the 1990s that we mailed out called “In Truffled Times.” Well, we decided to bring that back and make it the title of our blog. In these modern times, what a better way to deal with the stresses of contemporary life than to ruminate on them while savoring a chocolate truffle or torte. The first “In Truffled Times” was a reprint of a review of the Truffle Shop written by Heather MacDonald for The Union newspaper in 1993. It had some history of the Truffle Shop, the roots of Bill DeGroot and Rudy Udarbe. The newsletter also included a late 20th Century artifact called a “Mail In Form” (does anyone do that any more?) There was a listing of the Desserts and “A Note from the Chef…” about some of the plans Chef DeGroot had for new products. We’ll get into the history and other subjects in upcoming “In Truffled Times” blog posts.